21st Century works of art including acrylic paintings @ Ranchi Art & Antiquarian Books. "Grey", mixed media work from Urban Detritus, signed verso Andrew Hornett, Norfolk, U.K., 2014. A Sunny Day in Scarborough, signed Alice Maw. 2013. 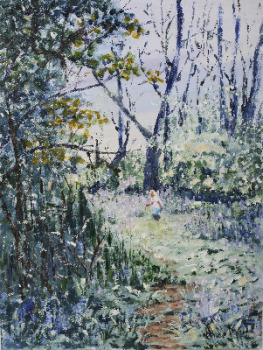 Bluebell Wood, acrylic on canvas, signed Alice Maw. 2009. SOLD BY ARTIST 11/2016. Love, colour relief print on paper, titled, signed Hannah Saxby and dated verso. 2013. Packwood House Window, acrylic on cardboard, signed Christine Aug 2015. (Christine Pallett). Framed. 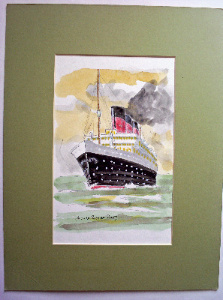 Passenger Liner under full steam, watercolour on card, signed Paul W Rotton 2003. SOLD 20.12.2013. Passenger Ship off the Coast, watercolour on Blick card, signed Paul W. Rotton 2003. Unframed. Passing Storm, Fishing Boat on Beach at Aldeburgh, acrylic on board, signed Gordon Higgs, June 2010. Unframed. Pool of London with tugboat, watercolour, signed R. Buchanan, c1990. Framed. Study of an Owl. Charcoal, graphite and coloured pencil drawing, signed N. Mory. 2013. SOLD by artist. The Gatehouse at Alvaston Hall, Cheshire, life drawing on paper, signed Christine 5 Aug 2010. (Christine Pallett). Framed.